Not to be confused with Dodge Lancer. The Lancer has been marketed as the Colt Lancer, Dodge/Plymouth Colt, Chrysler Valiant Lancer, Chrysler Lancer, Eagle Summit, Hindustan Lancer, Soueast Lioncel, and Mitsubishi Mirage in various countries at different times, and has been sold as the Mitsubishi Galant Fortis in Japan since 2007. It has also been sold as Mitsubishi Lancer Fortis in Taiwan with a different facelift than the Galant Fortis. In Japan, it was sold at a specific retail chain called Car Plaza. Between its introduction in 1973 and 2008, over six million units were sold. According to Mitsubishi, there were nine generations of development before the current model. Mitsubishi ended production of the Lancer in August 2017 worldwide, with the exception of Taiwan and Mainland China. The first Lancer (A70) was launched in February 1973. It served to fill the gap between the Minica kei car and the larger Galant. The sporting 1600 GSR model began the Lancer's long and successful rally history, winning the Safari Rally twice and the Southern Cross Rally four times. There were four body styles, two- and four-door sedans, a two-door hardtop coupe and a long-running five-door station wagon (built until replaced by the front-wheel drive Lancer/Mirage Van in March 1984). Engines were different 1.2-liter, 1.4-liter, and 1.6-liter fours. This car was marketed under a variety of names: Dodge Colt in the United States, Plymouth Colt in Canada, Dodge Lancer in some Latin American countries, Chrysler Valiant Lancer in Australia, and Colt Lancer in some European markets. In February 1975 the Lancer was complemented by a hatchback called the Lancer Celeste, succeeding the Galant FTO. It was also called the Mitsubishi Celeste (New Zealand) or Colt Celeste in some markets; and sold as the Chrysler Lancer in Australia, the Dodge Lancer Celeste in El Salvador, the Plymouth Arrow in the United States, and the Dodge Arrow in Canada. Four-door Lancer assembly began in New Zealand in 1975, supplementing the larger English Hillman Avengers also built locally by importer Todd Motors. The Celeste was imported built-up from Japan initially and assembly of a single 1.6- liter, manual transmission model began in 1978 followed by a minor facelift about a year later. The Celeste was originally available with 1.4- and 1.6-liter options, while a bigger 2.0-liter model was added later. An even larger 2.6-liter four was available in the US-market Plymouth Fire Arrow. The Celeste was facelifted in 1978, receiving square headlights and bigger squarer bumpers. 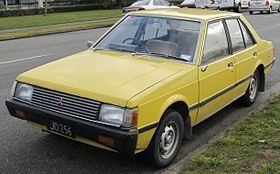 Production of the Lancer Celeste ended in July 1981 and it was replaced by the front-wheel drive Cordia in early 1982. In 1979, the all new Lancer EX was unveiled in Japan. Its new, clean and aerodynamic styling with integrated plastic bumpers reflected that of the recently introduced Galant and Sapporo. It was of a more European appearance than earlier Mitsubishi vehicles. Considerably more spacious, it grew in all dimensions. Only two engines were offered at first, a 1.4-liter MCA-JET equipped engine paired with Mitsubishi's Silent Shaft Technology, which generated 80 PS (59 kW) and a 1.6-liter engine that generated 85 PS (63 kW). The MCA-JET system was an entirely new concept when compared with the previously used carburetor system. The MCA stands for Mitsubishi Clean Air which meant that the EX passed both Japan and US emission standards, while the new cylinder head design of the engine gave way for a Jet valve which introduced an extra swirl of air to the combustion chamber, swirling the fuel-air mixture for a cleaner, efficient and more thorough burn. In addition to these improvements, another breakthrough in the Lancer lineup was the Silent Shaft Technology, which was actually two counterbalancing shafts that rotated in opposite directions, cancelling the power pulses inherent in an inline four-cylinder engine. This reduced both engine noise and vibration, and provided a smoother driving experience. The 1.8-liter Sirius 80 engines were then introduced in the Lancer in 1980, expanding the Lancer's range of engines. Also, a turbocharged, 135 PS (99 kW) engine was added in 1980 for sportier performance, and an intercooler system was also integrated in the existing turbocharged engine to produce 160 PS (118 kW) in 1983. In 1980, The Lancer EX was introduced with a 1.8-liter turbocharged inline-four option known as the 1800GSR and GT Turbo. The first generation 1800GSR and GT were only available with a turbocharged, non-intercooled 135 PS (99 kW). New Zealand importer Todd Motors assembled the new Lancer EX from 1980 with 1.6-liter carburetor gasoline engine and a choice of manual or automatic transmission. The model was also a popular base for rally cars in that market, with some success. It was replaced by the front-drive Tredia in 1982 with the Cordia coupe equivalent effectively replacing the earlier Celeste. In Europe, the Lancer EX sold well as its restrained styling better matched the desires of European buyers than its somewhat fussy predecessor. Other considerations concerned handling and also the demand for more passenger room, as Mitsubishi tailored the Lancer towards European consumers. It went on sale locally after making its European premier at the 1979 Frankfurt Show. Unlike in Japan, European buyers could also get a 1.2-liter option which suited local tax conditions. Claimed outputs in Europe were lower than in the domestic market, with the 1200, 1400, and 1600 being good for 40, 50, and 60 kW (54, 68, and 82 PS) respectively. Here, the Lancer EX was also offered with a turbocharged 2.0-liter engine, known as the Lancer EX 2000 Turbo. It achieved a maximum output of 125 kW (170 PS) and managed a top speed of 200 km/h (124 mph). This model was equipped with electronic fuel injection. A rally version of the Lancer EX 2000 Turbo was made for the 1000 Lakes Rally that gave out 206 kW (280 PS). At home, sales of the turbo model were low because of emission regulations Japan imposed at that time. w1400 SL, GL – Four-door sedan powered by a 1.4-liter engine, with a four-speed manual transmission; a five-speed was also introduced (1979–1987). 1200 EL, GL, SL – Same as the 1400, with a 1.2-liter engine option (1979–1983). The EL was the lowest priced version with very little equipment. 1400 GL A/T, SL, GLX – Three-speed automatic version with a Turbo, SL replaced GL in 1983 (1979–1987). 1600 XL – Four-door sedan powered by a 1.6-liter engine, with a three-speed automatic transmission (1979–1983). 1600 GSR – Four-door sedan powered by a 1.6-liter engine with twin carburetors, with a five-speed manual transmission (1980–1983). 1600 XL Super – Same as the XL, with minor changes (1983–1987). 1800 SE – Four-door sedan powered by a 1.8-liter producing 100 PS (74 kW) engine, and available with a 5 speed manual transmission or a three-speed automatic transmission (1981–1983). 1800 GSR Turbo – Four-door sedan powered by a turbocharged 1.8-liter engine producing 135 PS (99 kW), with aesthetic upgrades (1981–1983). 1800 GT Turbo – Same as the GSR, but with a different body trim (1981–1983). 1800 GSR Turbo Intercooler – Intercooler version of the first turbo version, producing 160 PS (118 kW), and with minor changes to the aesthetics (1983–1987). 1800 GT Turbo Intercooler – Same as the GSR Turbo Intercooler, again with different body trim (1983–1987). 1800 GSL Turbo – Same as the GSR Turbo Intercooler, only it used the engine from the GSR/GT Turbo, and equipped with a three-speed automatic transmission, and with a more luxurious interior. Along with an AM/FM multi-cassette stereo system (1983–1987). Between 1988 and 2000, the Lancer in Japan derived from the subcompact Mirage—itself sold in many export markets under the name Colt. Mitsubishi had originally launched the Mirage in 1978 as a front-wheel drive hatchback, with a sedan variant later released in 1982—and a version of which sold in Japan as Lancer Fiore. Five generations of Mirage were manufactured by Mitsubishi up until 2003, with new generations released in 1983, 1987 (with the equivalent Lancer delayed until 1988), 1991, and 1995. It was not until 1988—with the 1979 to 1987 Lancer now departed—that the Mirage-based Lancer eschewed the Fiore suffix. Between 1982 and 1987, the aforementioned Mirage sedan with minor styling modifications sold as the Lancer Fiore through Japanese retail channels. The Fiore spanned two generations, the second of which came to the market in 1983. Internationally, the Fiore sedan often sold under the abbreviated name Lancer, and sometimes as the "Lancer F" (for example, in Germany). Thus, with the rear-wheel drive Lancer as introduced in 1979 and the front-wheel drive Lancer Fiore, Mitsubishi had two similarly sized models competing in the same market segment, sometimes even while sharing the Lancer badge. Although naming conventions varied, for all generations, sedan versions of the Mirage were typically badged as Lancer in export markets, although notably not in the United States. In Japan, sedan variants of the Mirage and Lancer sold alongside one another with minor differences in trim. The station wagon, part of the 1983 and 1991 iterations, was typically known as the Lancer in export markets. Likewise, the Mirage coupe variant, available with the 1991 and 1995 generations, also became part of the Lancer lineup in some regions. Mitsubishi introduced replacements for the Mirage starting in 2000, with a new generation of Lancer sedan—now larger and having moved up to the compact segment. Then in 2002, a subcompact five-door hatchback badged Colt internationally became available, thus substituting the Mirage hatchback. By 2003, the Mirage had been completely phased out of mainstream Japanese production and Lancer became the primary title for Mitsubishi's compact offerings. November 2000 saw the release in Japan of the Lancer Cedia (meaning CEntury DIAmond); though in most markets the previous 1995 vintage Mirage-based Lancer continued on, built at Mitsubishi's Mizushima plant in Japan. The new model was available in sedan and station wagon forms. In Europe, the Lancer was not offered in some countries, being too close to the size of the Dutch-built Mitsubishi Carisma, so the Evo VII model sold there bore the Carisma name. This series of Lancer is still sold in Japan where the 2007 onwards generation Lancer is known as "Galant Fortis". In February 2003 for the 2004 model year, a heavily restyled Lancer surfaced with a front styling that brought it into line with the Mitsubishi corporate look, as well as a restyled rear, to further differentiate itself from the Lancer Evolution. The car's grille was then redesigned again in 2005 for the 2006 model year. In Japan, the Lancer Cedia was offered with many different trim levels and engines, including some options never exported. It was also one of the first models to use the INVECS-III CVT transmission. There was also a Ralliart version of the Sportswagon which was powered by a turbocharged 1.8-liter GDI engine. As of 2009, this generation of Lancer sedan is still being sold alongside the newer 2007 era generation, which is known in the home market as the Galant Fortis. 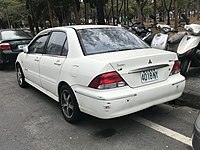 In Taiwan, the Mitsubishi Lancer was produced and marketed by China Motor Corporation, and the car was slightly restyled in the beginning with larger front grilles, extra chrome trims, and the rear license plate located on the trunk lid instead of the rear bumper. Later, following the internationally sold facelift version, the front lamps were restyled and reshaped to be triangular while the tail lamps extended onto the trunk lid which is different from the version sold in other parts of the world. An additional facelift was added again in 2005 with white marker lights in the front replacing the amber ones and restyled tail lamps. In Indonesia, the Lancer was available in GLXi and SEi trims. It was assembled locally and sold from 2002 until 2012. In Malaysia, the Lancer was made available after Mitsubishi had sold all its shares in Malaysian carmaker Proton, marking the return of Mitsubishi in Malaysian market after being absent since 1985 due to the agreement with Proton. The Lancer sold in Malaysia was powered by the 4G18 engine which also powered the early 1.6-liter Proton Waja model. In the Philippines, the Lancer underwent a facelift, now without the central semi-triangle in the grille. It is offered in two trims, the base GLX with a five-speed manual and the GLS with an all-new INVECS-III CVT with manual override. Both are powered by the 1.6-liter 4G18 SOHC engine. In Pakistan, this variant was launched in 2005 with cosmetic changes from the front and the back. Thai production was switched to the new model, and in all markets except for India the previous model was no longer marketed, four years after the Cedia's introduction. India received this 2000 era series of Lancer in 2006, known locally as the Mitsubishi Cedia to distinguish it from the previous version which was assembled and sold as the Lancer till June 2012, and Mitsubishi Cedia production closed in November 2012. In Australia, this series of Lancer was introduced as the CG series in July 2002 with the 2.0-liter 4G94 engine. The 2003 facelift, designated the CH series, introduced a heavily updated VR-X, which included new 16" alloys, stiffer suspension, body styling kit, and gear shifter borrowed from the Lancer Evolution. In 2004, the new Lancer wagon was introduced as a direct replacement for its ageing circa 1992 predecessor. In August 2005, all Lancers were upgraded to the 2.4-liter 4G69 engine, producing 115 kW (154 hp) and 220 N⋅m (162 lb⋅ft) of torque. The upgraded engine also saw a change in trim levels and upgraded equipment—the ES and LS models now featured a more upmarket looking black interior, while the VR-X gained a new black grille to closer resemble the Lancer Evolution IX. The equipment levels of all models were also upgraded, with the LS and VR-X gaining climate control, and a premium audio system sourced from the luxury Mitsubishi Verada. The Exceed model was discontinued, and all updated models now used JDM sized rear bumpers instead of the larger USDM sized versions. Additionally, the wagon also saw these changes; and as of 2007, continues to be sold alongside the sedan. The ES and LS models were given a minor facelift for the 2007 model year; this time gaining the same front grille as the US models, and putting it into line with the current corporate look—similar to that of the Colt and the locally built 380. A limited edition ES model dubbed "Velocity" went on sale prior to this generation being replaced. This package included VR-X grille, rear spoiler, leather/Alcantara bolstered seats, sports pedals, 15-inch alloy wheels and chrome exhaust tip—all for the same price as the previous standard ES. In some European markets, the Lancer began to take the place of the Carisma in 2004. It is powered by a 1.3-liter SOHC 16-valve 4G13 engine producing 82 PS (60 kW) at 5,000 rpm and 120 N⋅m (89 lb⋅ft) of torque at 4,000 rpm. The next engine in the range is the 1.6-liter SOHC 4G18 engine producing 98 PS (72 kW) at 5,000 rpm and 150 N⋅m (111 lb⋅ft) at 4,000 rpm. Finally, there is the 2.0-liter DOHC 4G63 producing 135 PS (99 kW) at 5,750 rpm and 176 N⋅m (130 lb⋅ft) at 4,500 rpm. In North America, the Lancer was introduced in 2001 for the 2002 model year as a direct replacement for the Mirage. In the United States, Chrysler had offered an unrelated Dodge Lancer at various stages between the 1950s and 1980s. However, when Chrysler briefly controlled Mitsubishi through the DaimlerChrysler-Mitsubishi alliance from 2000 through to 2004, the license to the "Lancer" name was relinquished to Mitsubishi for usage in North America. Consequently, after Mitsubishi discontinued the 1995 series Mirage for North America in 2001, the replacement model adopted the Lancer name for the first time. North American Lancers were powered by a 2.0-liter 4G94 engine producing 120 hp (89 kW) and 130 lb⋅ft (176 N⋅m) of torque. In Mexico, the Lancer sedan was available in DE, ES, LS and GS trims with a 2.0-liter DOHC 4G63 engine. In addition to the facelift, North America received three additional models to the Lancer line in 2004—Lancer Ralliart, LS Sportback and Ralliart Sportback. Ralliart slots in between the base models and high-performance Evolution. These cars came equipped with Mitsubishi's 2.4-liter 4G69 engine (rated at 160 hp (119 kW)/ 162 lb⋅ft (220 N⋅m) for the Sportback, and 162 hp (121 kW)/ 162 lb⋅ft (220 N⋅m) for the Ralliart). The power gain was due to a tuned muffler for the Ralliart, and also included a new, stiffer suspension package that improved handling and lowered for Ralliart and lifted the LS Sportback by 2.9 inches. The LS Sportback had 15-inch steel or optional 15-inch alloy wheels. The Ralliart came with 16-inch alloy wheels, front bucket seats borrowed from Japan's Mitsubishi Evolution GT-A, optional fog lamps, and a new aerodynamic ground package for Ralliart. The LS Sportback and Ralliart Sportback were equipped with a four-speed INVECS-II automatic transmission, while the Ralliart came with a five-speed manual transmission with an option for the four-speed automatic. For the 2005 model year, the grille was changed to include more fins to reflect a closer similarity to the North American Galant. For the 2006 model year, the fascia was changed again from a bridged fascia to one with an open vent after Mitsubishi received complaints from current owners regarding its similarity in appearance to General Motors Division Pontiac's corporate look, and to bring the appearance closer to its bigger brother, the Evolution. The Lancer Sportback wagon was cancelled in the United States one year after its release, but the Mitsubishi Lancer wagon was sold in Canada for a while longer. In 2005, Mitsubishi revealed the "Concept X" model car at the Tokyo Motor Show and its "Concept Sportback" model at the Frankfurt Motor Show. The new Lancer was previewed by these two concepts. The new Lancer was officially revealed in January 2007 at the Detroit Motor Show and went on sale in North American markets in March 2007 as a 2008 model. New Lancer features Mitsubishi's next-generation RISE safety body. With the exception of the Lancer Evolution X, the Lancer is marketed as the Galant Fortis (Latin for strong, brave and resolute) in the Japanese domestic market. It comes in three trim levels: Exceed, Super Exceed, and Sport. Due to popular demand of the previous 2000-era Lancer in Singapore, it continued to be sold alongside the new 2007 era Lancer which was called "Lancer EX" to differentiate itself from the former. The 1.5- and 2.0-liter engine sizes, and a flagship GT trim level are available in Singapore. For model year 2009, the design was refreshed all around with updated front grille, darkened clear tail lamps, and chrome lining with an additional floor console internally. The rear brakes have also been upgraded for the 2.0-liter variants to disc brakes for better stopping power. In Malaysia, the 2007-2017 Lancer was first launched in August 2007 with a sole variant known as GT. The Lancer was then updated in 2009 and an EX variant was launched in July 2010. In October 2010, the Sportback bodystyle was launched in October 2010. The Lancer was then updated in August 2012 and April 2014. Also, Proton had renewed cross-licensing and technology transfer agreements with Mitsubishi as of October 2008 and lead to the Proton Inspira which is a badge-enginerred 2007-2017 Lancer. In Indonesia only the GT is sold and it utilizes the new 2.0-liter 4B1 engine and is sold alongside the Evolution X. The previous generation Lancer was still sold, marketed as the Cedia using the 1.8-liter 4G9 engine. With the agreement with Proton finalized in October 2008, it is expected that the Lancer-based Proton Inspira will be exported to Indonesia. Hong Kong received its unique edition of the Lancer in 2008, dubbed the Lancer 2.0. The car comes in two trim levels, without a name for either of them. Both are equipped with the 4B11 2.0-liter engine, seven airbags, eight-speaker stereo system, adaptive front-lighting system (AFS) with HID as well as 18-inch alloy wheels. The upper trim has Ralliart style body kit which includes a revised front bumper, side skirt, rear bumper with diffuser and the addition of a correct-to-Evolution X rear spoiler, while the lower trim make do without the above-mentioned features. In the Philippines, the Lancer arrived in mid 2008 known as the "Lancer EX" to differentiate it from the preceding model Lancer still sold there. Initially available only with the 2.0-liter 4B11 powerplant, the preceding Lancer was phased out in 2011 and was replaced with a 1.6-liter version of the new model. At the same time, the 2.0-liter engine was confined to top models due to lack of demand in the face of rising fuel prices. In 2011, three variants were available the GLX which is the base model available in five-speed manual or five-speed automatic, no fog lights and three-beam headlights. The GLS is the middle variant and has fog lights, GPS navigation with touchscreen. GLS has the same headlights with the GLX variant and the top of the line variant which is the MX. The MX has the same features as the GLS, the only differences being that it has HID headlights and blue LCD monitoring screen beneath the speedometer. In 2012, the GLS variant was phased out. Between August 2015 and August 2017, GHK Motors (Mitsubishi Brunei) had offered a version of the Lancer Sportback under the name Mitsubishi Galant in Brunei. The Galant is equipped with the 2.4-liter engine, 18-inch alloy wheels, a Ralliart style front grille, side skirts, rear spoiler, and sports front seats. The new generation Lancer was released in Australia in October 2007, designated the CJ series and was initially available in ES, VR and VRX trims. The ES included cruise control, driver, passenger and knee airbags, stability and traction control as standard. The VR added alloy wheels, foglights, side skirts, boot lip spoiler, rain-sensing wipers, automatic headlights, six-disc CD changer, as well as curtain and side airbags. The VRX received extra skirts, a larger rear spoiler, 18-inch alloys and a premium Rockford Fosgate sound system. All three models shared the same 4B11 2.0-litre engine and can be found with a manual gearbox or CVT. The Sportback body followed the sedan and has been available for all variants except the Aspire. In July 2008, the Lancer Evolution X (officially just "Lancer Evolution" at the time) became available for orders in Australia. In September 2008, another variant, the Aspire, was introduced. The Aspire was based on the 2009 model VRX, which had a new 4B12 2.4-litre engine. The Aspire included more luxury features and only came with a CVT, whereas the VRX maintained a manual gearbox option. In late 2008, the Ralliart variant became available. It featured a single turbocharged version of the 4B11 engine, all-wheel drive (AWD) and a twin-clutch six-speed (TC-SST) gearbox. In 2010, the limited edition ACTiV was added to the lineup. The ACTiV was based on the ES and added features such as 16-inch alloy wheels, side skirts, rear spoiler, hands-free Bluetooth and multi-function leather steering wheel. Various special models have also been introduced, such as the Platinum Edition, which is based on the VR but added a chrome grille, window surrounds (sedan only), MMCS satellite navigation and Bluetooth. The RX version is derived from the ES but comes with standard alloy wheels. Another model introduced in 2010 was the SX coming with factory alloys, leather steering wheel and gear shifter as well as factory spoiler. From model year 2013 onward (introduced in late 2012), the Aspire was dropped. In Europe, a diesel model has been available also, with the 2.0-liter 103 kW (138 hp) engine sourced from Volkswagen. From September 2010, it is also available with Mitsubishi's own developed 1.8- liter 4N1 engine. This engine has an aluminium cylinder block, four valves per cylinder and a common rail injection system with variable geometry turbocharger and variable valve timing. It develops 85 kW (116 PS; 114 bhp) and 300 N⋅m (221 lb⋅ft). In Ireland, the specifications are different from those of models sold in the United Kingdom. The Lancer is available in five-door hatchback (Sportback) or four-door sedan body styles. Engines are the 1.5- and 1.8-liter petrols and the 2.0-liter diesel—all available in the United Kingdom until 2012. Trim levels are GS2, GS3, and GS4 for the saloon, and GS2, GS3, and Juro (satellite navigation and rear-view camera) for the Sportback. The Sportsback Juro model marked a temporary end to the line in the UK and was the most generously equipped. A Ralliart version (petrol), a detuned version of the Evolution, was also available. Mitsubishi intend to supply the UK with 400 further Lancers in late 2014. For the United States, the new Lancer was initially available in DE, ES, and GTS trim levels. DE, ES, and GTS models are powered by a GEMA based 4B11, 2.0-liter DOHC engine producing 152 hp (113 kW) (except for California models which have been detuned to 143 hp (107 kW) to meet regulations). Transmission options include a brand new F1CJA continuously variable transmission (CVT), sourced from Jatco, alongside a regular F5MBB five-speed manual sourced from Aisin Seiki. GTS models get a six-speed paddle shift version of the CVT. In Canada, a fourth model (SE) was introduced to the Lancer lineup. The SE model is a cross between the ES and GTS models. Features not included in the SE model that are found in the GTS are the FAST key, automatic climate control, carbon-fiber trim pieces, leather-wrapped steering wheel and shift knob, and 18-inch wheels. For US markets, starting with the 2009 model year, an ES Sport version was released similar to the SE model for the Canadian market. Externally the ES Sport is similar in appearance to the GTS—with side skirts, rear spoiler, etc. (with the exception of the wheels, the ES Sport retains the ES wheelset). The ES Sport also uses the 2.0-liter engine. For 2009, the GTS is powered by a 2.4-liter 4B12 engine producing 168 hp (125 kW) and 167 lb⋅ft (226 N⋅m). For 2012, A new trim level called SE was added. The SE model features the 2.4-liter 4B12 engine and Mitsubishi's all-wheel drive system. The SE is only available with a CVT transmission. For 2013, another trim level called GT was added. Based on the all-wheel drive SE trim level, excluding the all-wheel control system, the GT features sportier suspension, upmarket options, and an available manual transmission. The five-door hatchback version, known as the Sportback, was introduced for the Canadian market in spring 2009, and in the US for the 2010 model year in mid-2009. A detuned and cheaper version of the Evolution X was announced at the 2008 North American International Auto Show. This model became available for purchase in the United States in October 2008. For 2009, the Ralliart is available exclusively with the TC-SST transmission. The TC-SST transmission equipped in the Ralliart offers two modes (Normal, Sport) rather than the three modes the same transmission offers in the Lancer Evolution X MR (Normal, Sport, S-Sport). The car also includes a simplified version of the Evolution X's AWD system, with a simple "mechanical limited slip" rear differential. To differentiate it from the previous model, still on sale, this model is marketed as "Lancer Serie R" in Chile. For the same reason, in El Salvador, depending on the engine and trim, this series is titled "Lancer EX" or "Lancer GT". In Brazil, Lancer has been officially sold by Mitsubishi Motors since 2007, and since 2015 is produced in Catalão Mitsubishi's factory. It is sold in four versions: MT, HL, HLE and GT. All versions come with the 2.0-liter 4B11 l4 engine (gasoline). The Lancer Sportback was sold until 2013 in a single version, signed by Ralliart, and the Lancer Evolution X is also sold, although not produced locally. In October 2015, Mitsubishi released details of the model year 2016 Lancer facelift for North America. The MY16 update was announced and released for Australia in December 2015. It sports a mildly altered front and does without the Ralliart-style grille of the MY15 version, now with a cleaner front bumper with integrated chrome upper and lower grilles. New LED daytime running lamps, foglights and side skirts complete the exterior changes, while the cabin gains a high-contrast instrument cluster, a new front centre console with silver and black accents, and a new colour touchscreen audio system with DAB digital radio. Mitsubishi Motors North America’s executive vice president and CEO, Don Swearingen, confirmed in January 2017 that Mitsubishi would end the Lancer’s production in August 2017, without a successor. Mitsubishi’s main focus was to be on crossovers and SUVs. However, production of the Mirage hatchback and Mirage G4 sedan will continue due to ongoing popular demand for the Mirage nameplate in the North American market. The Lancer Fortis and Lancer iO are derivatives of the global Lancer model. Both models were developed primarily for the Taiwanese market, historically a stronghold for Mitsubishi vehicles. The Lancer Fortis and iO are locally assembled in Taiwan and China by CMC and Soueast respectively. CMC also exported the Lancer Fortis to the Middle East. The Lancer Fortis made its debut in Taiwan in August 2007. The Fortis has a unique exterior design, but its interior styling and mechanical underpinnings are largely identical to the global Lancer model. Early models of the Lancer Fortis were powered by the 157 hp (117 kW), 2.0-litre 4B11 engine paired to the INVECS-III CVT gearbox. Later variants were offered with the 143 hp (107 kW), 1.8-litre 4B10 plant, while the 2.0-litre Fortis models were discontinued by 2010. In April 2008, Mitsubishi launched the Lancer iO in Taiwan. The iO was pitched as a sportier version of the Lancer Fortis, featuring a more aggressive front grille and bumper combination. In February 2012, Mitsubishi discontinued the Fortis-based iO, and launched the global Lancer locally under the iO nameplate. The Taiwanese colloquial term for the 2012 Lancer iO and the global Lancer is 'shark head' (鯊魚頭). The Lancer Fortis made its Chinese debut at the 2013 Shanghai Motor Show. The Chinese market Lancer Fortis features a different front grille and bumper design in addition to other minor cosmetic changes. The base models are powered by the 113 hp (84 kW), 1.6-litre 4A92 engine, and the range topping variants received the 1.8-litre 4B10. The Lancer Fortis in China is positioned in between the more expensive Lancer EX and the cheaper Lancer Classic. The Taiwanese market Lancer Fortis and iO were simultaneously facelifted in May 2014. The design of the front grille and bumper combination on both models became more aggressive, while the Fortis adopted the 'shark head' design and the headlamps from the global Lancer. The rear lamps on both models were also revised, and the interior designs received minor cosmetic enhancements. The powerplant configuration for both models were refined for better fuel efficiency, but were otherwise largely unchanged. The Chinese market Lancer EX was later updated in line with the Lancer iO design. The interior of a Mitsubishi Grand Lancer. In January 2017, Mitsubishi Motors agreed to continue the Lancer nameplate in Chinese markets including Taiwan and mainland China after 2017, due to ongoing popular demand for the Lancer nameplate within the Chinese-speaking world. The development of the new Grand Lancer in Taiwan was led and designed by the Taiwanese China Motor Corporation (CMC). Part of the design was partnered with Pininfarina Shanghai. Due to the international version being discontinued, the new generation Lancer will be built on the same platform as the existing model as an extensive facelift. It comes with the new Mitsubishi Dynamic Shield grille and redesigned creases over the side body panels. The interior, front hood, front bumpers, front fenders, front and rear door panels including the rear passenger door window, the boot lid, and the rear bumper have been completely redesigned for the new generation, while the rest will be carried over from the pre-2017 model. Rear view of the Grand Lancer sedan. Within Australia, the Lancer has regularly been an entrant within the Top 10, & Top 20 Selling Vehicles. Following the discontinuation of the Lancer worldwide, Mitsubishi Australia President, John Signoriello, decided to stockpile as many lancers as possible prior to the discontinuation, in order to sell them in succeeding years. The following table stipulates the sales made in preceding years. ^ Ewing, Stephen. "Mitsubishi will end Lancer production in August". motor1.com. Motorsport Network. Retrieved 7 January 2017. ^ "All new 2008 Lancer" (PDF). AllNewLancer.ca. Archived from the original (PDF) on 2007-09-29. ^ "Lancer EX" (PDF). New-Lancer.com. 9 May 2013. p. 13. Retrieved 1 July 2015. Mitsubishi Lancer first hit the streets in 1973 and has never looked back. Over the past three decades, Lancer has evolved into a sports machine like no other, turning heads on city streets and rally courses alike. After nine generations of development, Mitsubishi's passion for driving has created a blend of power, performance and aerodynamics that will have sports driving connoisseurs instantly hooked, all combined with a style that is undeniably Lancer. ^ "Mitsubishi is killing the Lancer this summer". AutoBlog.com. ^ "Mitsubishi Lancer (Chrysler LB Lancer Hatchback )". GoAuto. John Mellor. Retrieved 8 October 2010. ^ James M. Flammang (1994). Standard Catalog of Imported Cars, 1946–1990. Iola, WI: Krause Publications. pp. 503–504. ISBN 0-87341-158-7. ^ Car Graphic: Car Archives Vol. 11, '80s Japanese Cars. Tokyo: Nigensha. 2007. p. 214. ISBN 978-4-544-91018-6. ^ Long, Brian (2007). Mitsubishi Lancer Evo: The Road Car & WRC Story. Dorchester: Veloce Publishing. ISBN 1-84584-055-0. ^ a b c Rombauts, Walter, ed. (15 September 1979). "Volledig veranderd, maar nog steeds dezelfde naam" [Completely changed, but still with the same name]. Keesings Auto Magazine (in Dutch). Antwerp, Belgium. 2 (17): 20–21. ^ Rombauts, Walter, ed. (15 September 1979). "Salon van Frankfurt is aanklacht tegen politieke machthebbers" [Frankfurt Show is an indictment of political leaders]. Keesings Auto Magazine (in Dutch). Antwerp, Belgium. 2 (17): 18. ^ "Lancer GLX". Mitsubishi Motors Venezuela. Archived from the original on 14 July 2013. ^ Long B. and Kunihara S. Mitsubishi Lancer EVO I to X: The Road Car and WRC Story. Veloce Publishing. ISBN 9781845840556. ^ "CH Lancer Prices Released". AutoWeb. Archived from the original on 12 October 2010. Retrieved 30 December 2008. ^ "Mitsubishi unveils "design study" shots of the production Evo X". Autoblog. ^ "Mitsubishi Galant Fortis Launched". World Car Fans. ^ "Mitsubishi Lancer 2.0 GT in Malaysia". Paul Tan's Automotive News. 2007-08-07. Retrieved 2018-11-15. ^ "Mitsubishi Lancer 2.0 GT facelifted in Malaysia!". Paul Tan's Automotive News. 2009-07-30. Retrieved 2018-11-15. ^ "Mitsubishi Lancer EX - a very different kind of Lancer". Paul Tan's Automotive News. 2010-07-16. Retrieved 2018-11-15. ^ "Mitsubishi Lancer Sportback 2.4 launched in Malaysia". Paul Tan's Automotive News. 2010-10-21. Retrieved 2018-11-15. ^ "Mitsubishi Lancer 2.0 GT updated in Malaysia". Paul Tan's Automotive News. 2012-08-09. Retrieved 2018-11-15. ^ "Mitsubishi Lancer 2.0 GTE detailed - now priced at RM118,888". Paul Tan's Automotive News. 2014-04-11. Retrieved 2018-11-15. ^ Tan, Paul. "Proton Inspira now officially open for bookings". PaulTan.org. Retrieved 19 July 2011. ^ Agus, Raghadah (7 August 2015). "Mitsubishi Galant's sporty revamp". The Brunei Times. Archived from the original on 22 April 2016. ^ Roslan, Wani (8 August 2015). "GHK Motors introduces Mitsubishi Galant Sportback". Borneo Bulletin. Archived from the original on 22 April 2016. ^ "Galant". GHK Motors. 2015. Archived from the original on 22 April 2016. ^ "Mitsubishi Lancer Evolution". CarSales.com.au. 11 Sep 2008. Retrieved 21 Mar 2017. ^ "Mitsubishi plugs gap with Lancer Aspire". CarSales.com.au. 17 Sep 2008. Retrieved 21 Mar 2017. ^ "Mitsubishi Lancer Ralliart". CarSales.com.au. 11 Nov 2008. Retrieved 21 Mar 2017. ^ "Mitsubishi gets ACTiV with new Lancer". CarSales.com.au. 5 Mar 2010. Retrieved 21 Mar 2017. ^ David Ross (26 March 2008). "Mitsubishi Lancer 2.0 Di-D GS4". Auto Express. Retrieved 19 May 2014. ^ "Mitsubishi Lancer – 4-doors, sedan". Auto-Types.com. 28 November 2010. Retrieved 19 May 2014. ^ Zevedei, Daniel. "Mitsubishi Lancer 1.8 DI-D ClearTec Edition Two – 4-doors, sedan". Auto-Types.com. Retrieved 19 May 2014. ^ "2008 Mitsubishi Lancer Review". JB car pages. Retrieved 25 February 2009. ^ a b "2009 Mitsubishi Lancer Review". JB car pages. Retrieved 25 February 2009. ^ "2010 Mitsubishi Lancer Sportback coming to America five+door style". Jalopnik. ^ "First Drives " First Drive: 2009 Mitsubishi Lancer Sportback". CanadianDriver. 30 March 2009. Retrieved 3 April 2010. ^ "2009 Mitsubishi Lancer Specs". JB car pages. Retrieved 25 February 2009. ^ "2008 Detroit Auto Show: 2009 Mitsubishi Lancer Ralliart". Edmunds. ^ Maric, Paul (1 October 2015). "2016 Mitsubishi Lancer update revealed: Australia confirmed and Ralliart dumped". CarAdvice. Retrieved 25 May 2016. ^ "2016 Mitsubishi Lancer busts out". Motoring. 16 December 2015. Retrieved 25 May 2016. ^ Beissmann, Tim (16 December 2015). "2016 Mitsubishi Lancer facelift brings extra equipment to ageing small car". CarAdvice. Retrieved 25 May 2016. ^ "Mitsubishi Lancer production to be discontinued in August". 6 January 2017. Retrieved 14 Feb 2017. ^ a b 張之杰 (30 August 2007). "國產7氣囊，Mitsubishi Lancer Fortis 64.5萬起". News.U-Car.com.tw (in Chinese). Archived from the original on 19 March 2017. Retrieved 19 March 2017. ^ "Lancer Fortis Launch". CMC-Motor.com. 19 March 2017. Archived from the original on 19 March 2017. Retrieved 19 March 2017. ^ a b 蔡致堅 (31 August 2007). 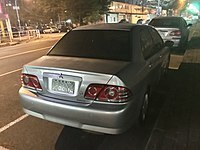 "MITSUBISHI Lancer Fortis 2.0全面升級，國產中型房車再創話題". AutoNet.com.tw (in Chinese). Archived from the original on 19 March 2017. Retrieved 19 March 2017. ^ "Mitsubishi Lancer Fortis" (in Chinese). newcar.u-car.com.tw. 19 March 2017. Archived from the original on 19 March 2017. Retrieved 19 March 2017. ^ 九重葛 (9 June 2008). "Mitsubishi Lancer iO (feature)" (in Chinese). feature.u-car.com.tw. Archived from the original on 19 March 2017. Retrieved 19 March 2017. 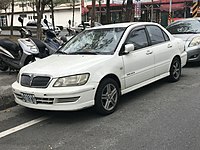 ^ "Mitsubishi Lancer iO" (in Chinese). newcar.u-car.com.tw. 19 March 2017. Archived from the original on 19 March 2017. Retrieved 19 March 2017. ^ 葉毓中 (10 April 2012). "Mitsubishi【試車報導】遲到，總比不到好！Lancer iO風格終一致" (in Chinese). carstuff.com.tw. Archived from the original on 19 March 2017. Retrieved 19 March 2017. ^ "Shanghai Motor Show 2013 (4)". MarkLines.com. 17 June 2013. Archived from the original on 19 March 2017. Retrieved 19 March 2017. ^ a b "Mitsubishi Lancer Fortis". ChinaAutoWeb.com. 19 March 2017. Archived from the original on 19 March 2017. Retrieved 19 March 2017. ^ a b Joey Wang (29 July 2016). "Spy Shots: This Is The New Mitsubishi Lancer EX For China". CarNewsChina.com. Retrieved 19 March 2017. ^ a b c d 梁尚倫 (22 May 2014). "形貌變更，Mitsubishi Lancer雙車系64.5萬元起改款登場" (in Chinese). news.u-car.com.tw. Archived from the original on 19 March 2017. Retrieved 19 March 2017. ^ Karkafiris, Michael (2017-03-23). "New 2018 Mitsubishi Grand Lancer Targets China And Other Asian Markets". Carscoops. Retrieved 2017-04-11. ^ Wallis, Robbie (2017-11-28). "Mitsubishi Australia hopeful Lancer will survive". GoAuto. Retrieved 2019-02-20. Wikimedia Commons has media related to Mitsubishi Lancer.